The Deschutes River below Dillon Falls. 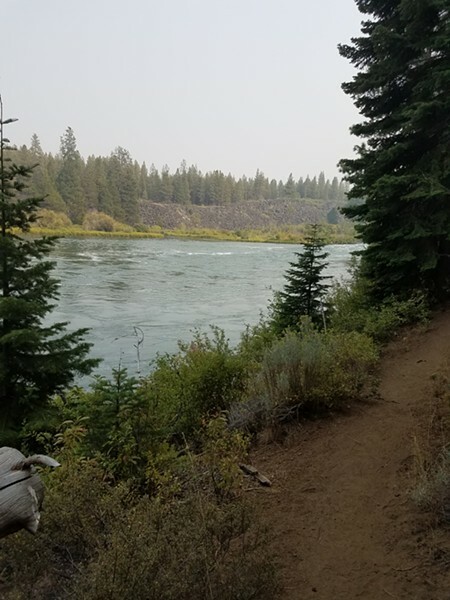 Cops say on Thursday, Aug. 23, an 84-year-old man lost his life after being swept over Dillon Falls on the Deschutes River. Ronald Stevens of Jackson, Wyoming and his daughter, 57-year-old blind Paralympian Nancy Stevens of Bend were canoeing on the river above Dillon Falls, when the canoe apparently tipped over, and they were unable to swim to shore before going over the 15-foot, Class V rapid, according to a press release from the Deschutes County Sheriff’s Office. Kayakers pulled the unconscious man from the water and assisted him to the trail embankment, where people who were hiking on the trail began CPR, according to the DCSO. The kayakers then paddled back across the river and assisted Nancy Stevens back to the trail where her father was. Deschutes County Search and Rescue transported Nancy Stevens to Aspen Camp in an inflatable boat with an outboard motor as Bend Fire Department and DCSO personnel took over CPR on Ronald Stevens. Their efforts were unsuccessful, as he was pronounced dead at the scene, according to the DCSO. Bend Fire transported Nancy Stevens to St. Charles, who sustained non-life threatening injures for further evaluation.